We use a variety of video formats to get key messages across. They tap into formats used by broadcast media as well as user-generated online video formats. Our medical journalists help you select stakeholders who can help reinforce your message. We then produce your video in a format that uses the credibility of corporate documentary and medical journalism. We use the power of video documentary to capture health industry stories in a compelling way. The best way to reach an online audience is to use visual grammar they are familiar with. All video production processes start with strategic marketing advice to map your key messages. Then we apply our extensive broadcast experience to produce top quality stories that get your message across. When you decide to use video for your medical marketing, your intention is to connect with your audience. We are all spoiled when it comes to watching video content on TV, YouTube, websites, Facebook & Instagram and on displays all around us. We help you cut through the noise and capture the attention. As a private clinic, an individual doctor, or a larger organisation, there are many ways to implement corporate documentary in your video strategy. A one-off production can be used to change or raise awareness. We will help you script, organise and execute the production from start to finish. If your strategy requires a series of videos or regular content for your YouTube channel and social media, we will use our extensive experience in broadcast and corporate medical journalism to design a workflow that makes video cost effective for your brand. A free assessment will help you to get started so you get an idea about the various possibilities and video workflows. And if your story needs regular updates and flexibility, we can train your team members to capture and store video content internally. We then empower you to make short video posts yourself, applying basic visual grammar and best practices, so you reach your audience in the most compelling and effective way. Ask us about our iPhone filming workshops and we will have you up to speed in no time. Our team builds on over 2 decades experience producing journalism driven content for TV stations, events, and online channels. As qualified television directors and journalists, we structure and package your content so it connects with your target audience in an authentic way. Video makes the best use of your audience's attention: with time-poor patients & stakeholders, you want to make every second count. Video is multi-layered and appeals to the senses. That is how it adds personality and emotion to your brand. 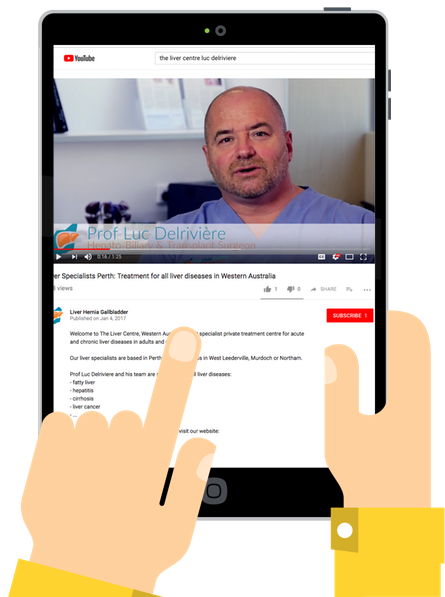 Before making decisions about the use of video in your clinic or in your healthcare organisation, book a free consult to discuss the format and the target audience. You will make the process more effective and create a bigger impact. We will go through essential questions. Where will your video be displayed, published, shared or shown? Who is the primary target audience? What do you want them to remember? What do you want them to feel? What is the overall tone of your video? What is the style? What production budget are you working with? Our consultants bring their extensive experience to the table. Having worked with healthcare professionals around the world, and with dozens of Australian specialist doctors, pharmaceutical industry stakeholders, and the Health Department, they know how to find a balance between your marketing ambitions...and the receptiveness of your audience. Book a free phone, Skype or face-to-face consult today to discuss your medical marketing video by Digital Practice.